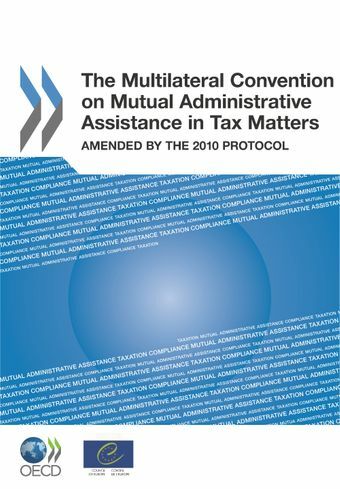 This publication contains the official text of the Multilateral Convention on Mutual Assistance in Tax Matters as amended by the 2010 Protocol. The original Convention was developed jointly by the Council of Europe and the OECD and opened for signature by the member states of both organisations on 25 January 1988. The original Convention was amended in 2010 to align it to the international standard on information exchange for tax purposes and to open it to all countries, responding to the call of the G20 to make it easier for all countries to secure the benefits of the new co-operative tax environment. The amended Convention entered into force on 1 June 2011.This Convention aims to help governments enforce their tax laws, provides an international legal framework for co-operation among countries in countering international tax avoidance and evasion. It offers a variety of tools for administrative co-operation in tax matters, providing all forms of exchange of information, assistance in tax collection and service of documents. It also facilitates joint audits and information sharing to counter other serious crimes (e.g. money laundering, corruption) when certain conditions are met. It preserves the rights of taxpayers, provides extensive safeguards to protect the confidentiality of the information exchanged, in particular in relation to personal data. The operation of this self-standing multilateral convention is overseen by a Co-ordinating Body comprised of the Parties to the Convention. The Convention was developed jointly by the OECD and the Council of Europe in 1988 and amended by Protocol in 2010. The Convention is the most comprehensive multilateral instrument available for all forms of tax cooperation to tackle tax evasion and avoidance, a top priority for all countries. The Convention was amended to respond to the call of the G20 at its April 2009 London Summit to align it to the international standard on exchange of information on request and to open it to all countries, in particular to ensure that developing countries could benefit from the new more transparent environment. The amended Convention was opened for signature on 1st June 2011. Since 2009 the G20 has consistently encouraged countries to sign the Convention including most recently at the meeting of the G20 Leaders Summit in September 2013 where the communique stated “We call on all countries to join the Multilateral Convention on Mutual Administrative Assistance in tax Matters without further delay.” Currently over 60 countries have signed the Convention and it has been extended to over 10 jurisdictions (Chart of Participating Jurisdictions). This represents a wide range of countries including all G20 countries, all BRIICS, almost all OECD countries, major financial centres and a growing number of developing countries. The amended Convention facilitates international co-operation for a better operation of national tax laws, while respecting the fundamental rights of taxpayers. The amended Convention provides for all possible forms of administrative co-operation between states in the assessment and collection of taxes, in particular with a view to combating tax avoidance and evasion. This co-operation ranges from exchange of information, including automatic exchanges, to the recovery of foreign tax claims. The Convention has taken on increasing importance following the G20’s call for automatic exchange to become the new international standard of the exchange of tax information, and the subsequent development of the Standard for Automatic Exchange of Financial Account Information. Given the Convention provides the ideal instrument to swiftly implement automatic exchange, Competent Authorities from 61 jurisdictions have signed a multilateral agreement under Article 6 of the Convention, which provides for the automatic exchange of information. The competent authority agreement implements the Standard for automatic exchange, specifying the details of what information will be exchanged and when. While the agreement is multilateral, the actual exchanges are bilateral.